The Global Volcanism Program has no activity reports for Caichinque. The Global Volcanism Program has no Weekly Reports available for Caichinque. The Global Volcanism Program has no Bulletin Reports available for Caichinque. The Global Volcanism Program has no synonyms or subfeatures listed for Caichinque. Caichinque is a relatively small Pleistocene-Holocene volcanic complex that forms a topographic high dividing Salar Capur from Salar Talar. More than a half-dozen vents produced andesitic-to-dacitic lava flows, with young flows descending to the NE and SE from the summit. One prominent flow traveled 6 km to the E, forming two lobes extending into the Salar Talar. The youthful morphology of the flows suggested a prehistorical age (González-Ferrán, 1995), but de Silva (2007 pers. comm.) considered the volcanic complex to perhaps be as old as late Pleistocene. The Global Volcanism Program is not aware of any Holocene eruptions from Caichinque. If this volcano has had large eruptions (VEI >= 4) prior to 10,000 years ago, information might be found on the Caichinque page in the LaMEVE (Large Magnitude Explosive Volcanic Eruptions) database, a part of the Volcano Global Risk Identification and Analysis Project (VOGRIPA). There is no Deformation History data available for Caichinque. There is no Emissions History data available for Caichinque. 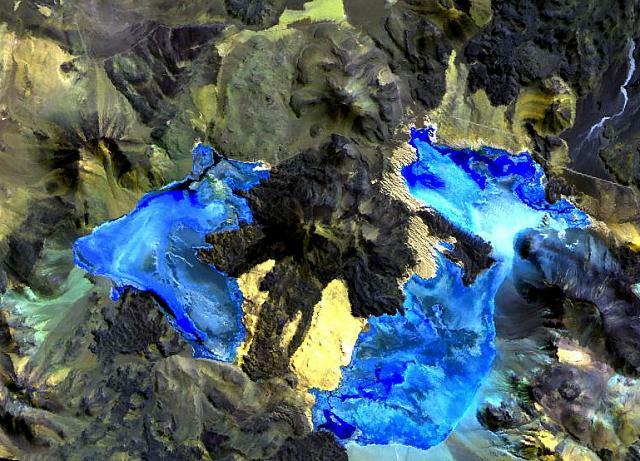 Caichinque volcano forms a topographic high dividing lakes of Salar Capur (left) from Salar Talar (right). More than a half dozen vents produced andesitic-to-dacitic lava flows, with young flows descending to the NE and SE from the 4450-m-high summit. One prominent flow traveled 6 km to the east, forming two lobes extending into the Salar Talar. Other youthful looking flows traveled to the west, forming lobes extending into Salar Capur, and SSW, dividing the two salars. NASA Landsat image, 1999 (courtesy of Hawaii Synergy Project, Univ. of Hawaii Institute of Geophysics & Planetology). There are no samples for Caichinque in the Smithsonian's NMNH Department of Mineral Sciences Rock and Ore collection. Large Eruptions of Caichinque Information about large Quaternary eruptions (VEI >= 4) is cataloged in the Large Magnitude Explosive Volcanic Eruptions (LaMEVE) database of the Volcano Global Risk Identification and Analysis Project (VOGRIPA).